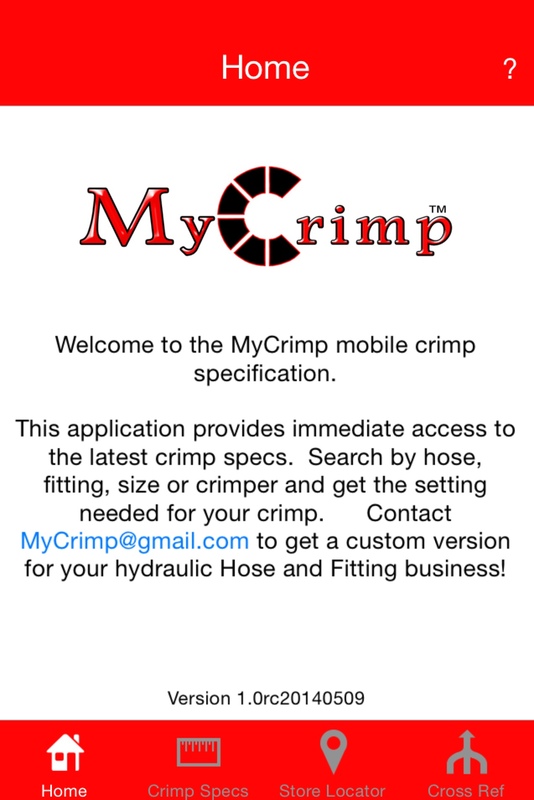 The MyCrimp™ Mobile App provides users with a way to quickly reference up-to-date crimp speciﬁcations provided by the hose and fitting manufacture. 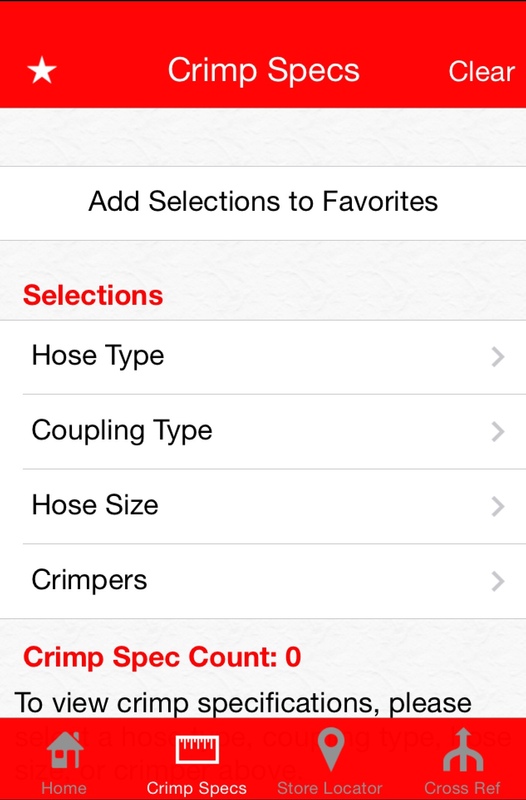 This data is search-able by hose type, coupling type, hose size, and crimper. This eliminates the need for prolonged searches in a catalog or website to ﬁnd an individual crimp speciﬁcations. This application will be available in different, manufacturer speciﬁc, versions. The MyCrimp™ version show here contained example data for demonstration purposes only. Manufactures crimp speciﬁcation for exactly the hose, ﬁtting and crimper you are using. Dynamic search filters search options as you go to quickly find the crimp specification you need. 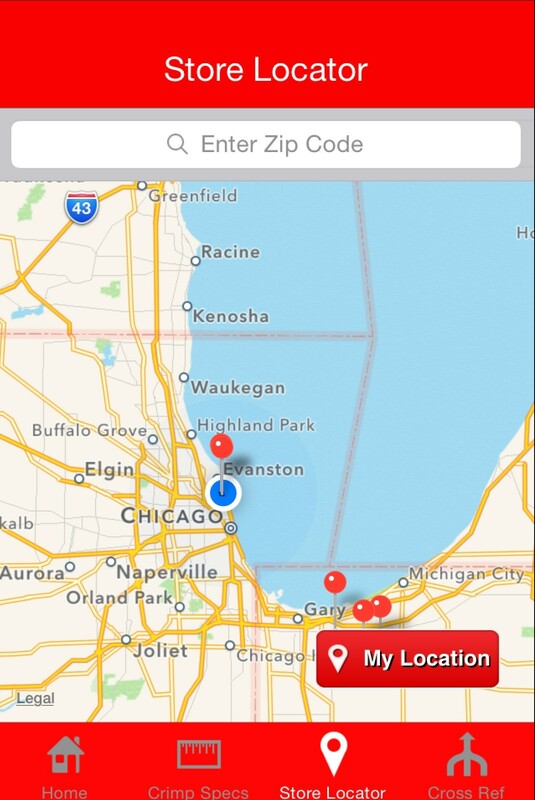 Integrated mapping feature allows users to locate the nearest outlet for hose and fitting products. Email crimp specifications and save favorites for quick access in the future. Each manufacturer version of the application contains a customized database, unique for the specific manufacturer's products. 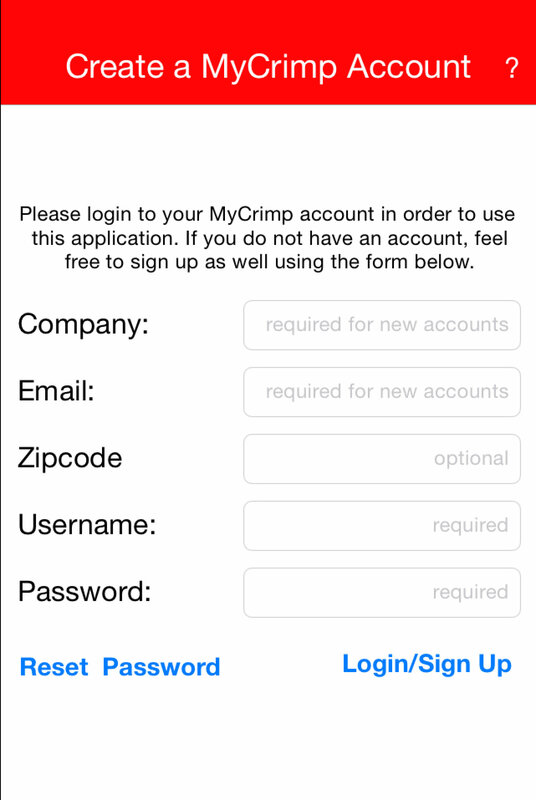 After downloading the app, users are prompted to enter login information and setup an account within the MyCrimp™ application. This process captures basic user and company information and sends a confirmation email to the user. Once verified, the user does not see this screen again. Main page for the application displaying the Manufacturer logo and a welcome text. The welcome text can be easily changed and can include working URLs and email addresses. Find the information you need to make the the perfect crimp. 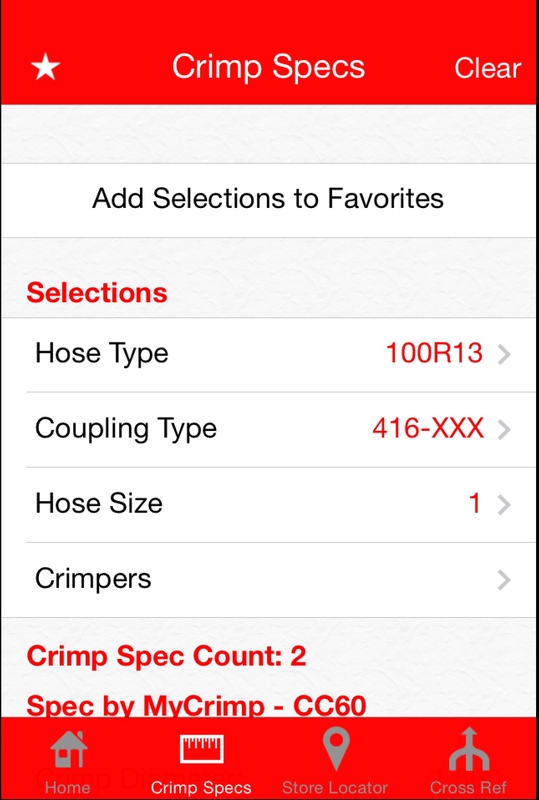 Search by Hose, Fitting or Crimper in any order. Go directly to the information you have save as favorites. 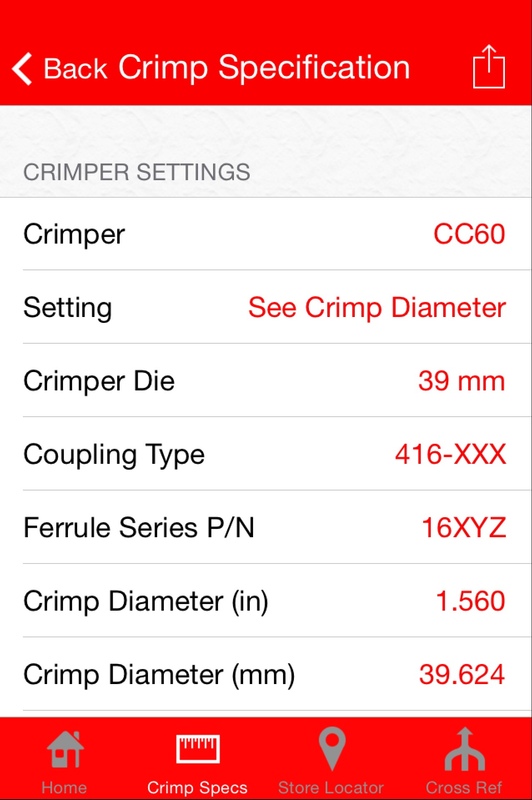 Dynamic Search results let you know how many crimp specifications match your parameters. Scroll down to see a summary of matching specifications. Drill inform full details or continue to refine your search. Drill in to see complete crimp specifications. All the information you need to prepare the crimper and hose for the crimp. Working pressure, Reference images and additional notes provide a complete crimp specification. Other support features include: Store Locator, Favorites to quickly access frequently used information, email crimp specs and hose and fitting part cross reference. Detailed application help available from within the application.